These words have become a familiar refrain at Langton Public School this fall as students explore the positive impacts that yoga and mindfulness can have on their overall well-being. 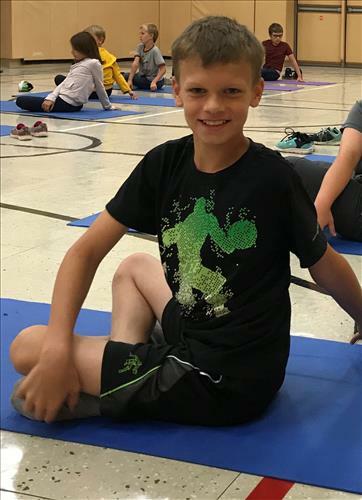 Grades 4-8 are currently participating in weekly yoga sessions learning not only about yoga poses to improve flexibility and muscle strength, but also about breathing techniques and mindfulness strategies that help to promote inner calm and relaxation. Students eagerly roll out their mats on yoga days and are beginning to notice small differences to both their physical and mental well-being. “Yoga is fun and helping me to become more flexible,” says a student in Grade 7. A Grade 6 student agrees. “When I’m doing yoga, it helps me to feel really calm,” she says. In addition to the weekly sessions in the school gym, all classes from Kindergarten to Grade 8 recently took part in a yoga and mindfulness workshop with local instructor Adrien Hurst. This is the third year that Hurst has taught a yoga workshop at Langton Public School, and students are always excited when they know she’ll be teaching. “Adrien is really cool and she’s so flexible and strong!” declares Grade 7 student Joshua Biel. Hurst introduces primary-aged students to yoga through a story-based class where they act out the story using a variety of simple postures. “It’s a positive way to engage them and keep yoga fun,” she says. With junior and intermediate students, Hurst works through a sequence of poses designed to improve balance and strength. She also focuses on building breathing techniques and mindfulness strategies with older students in order to help them listen better to what their bodies are telling them about how they are feeling. “Taking the time to focus on your breath for a few minutes helps us to calm down and really see how we are feeling,” Hurst reminds students. Weekly yoga classes at Langton will continue throughout the month, introducing students to ways to make yoga more accessible in their day-to-day routines, such as chair yoga. Hurst will return in early November for a final workshop.